pain is usually the main indicator of potential tooth decay, while it might not always be the cause of tooth decay, any pain in and around your teeth should be checked out. Tooth decay can slowly progress to the pulp (The inner workings of the tooth with blood vessels and nerve endings) as well as the periodontal space (the tissue holding the tooth to the bone), when this happens, pus is most often formed and you’ll find it difficult to apply pressure to the affected area, making it difficult to chew. Tooth decay, dental cavities or dental caries, however, you refer to it, tooth decay is one of the most common bacterial infections affecting teeth worldwide and it’s certainly an unwelcome sight in any mouth. It’s important, and, not to mention recommended, that you visit your dental hygienist for regular teeth cleaning at least twice per year in order to catch and treat any signs of tooth decay or other dental problems; you should also be able to identify some signs and symptoms of tooth decay yourself. While one main identifier of tooth decay is usually pain, this is not always the case, as tooth decay can be slow and virtually pain-free, while it can also manifest into a sinusitis type pain affecting the cheekbones, ears and surrounding areas. Here are some signs and symptoms you should keep a lookout for, and if spotted, get in touch with your hygienist. As mentioned pain is usually the main indicator of potential tooth decay, while it might not always be the cause of tooth decay, any pain in and around your teeth should be checked out. Tooth decay can slowly progress to the pulp (The inner workings of the tooth with blood vessels and nerve endings) as well as the periodontal space (the tissue holding the tooth to the bone), when this happens, pus is most often formed and you’ll find it difficult to apply pressure to the affected area, making it difficult to chew. 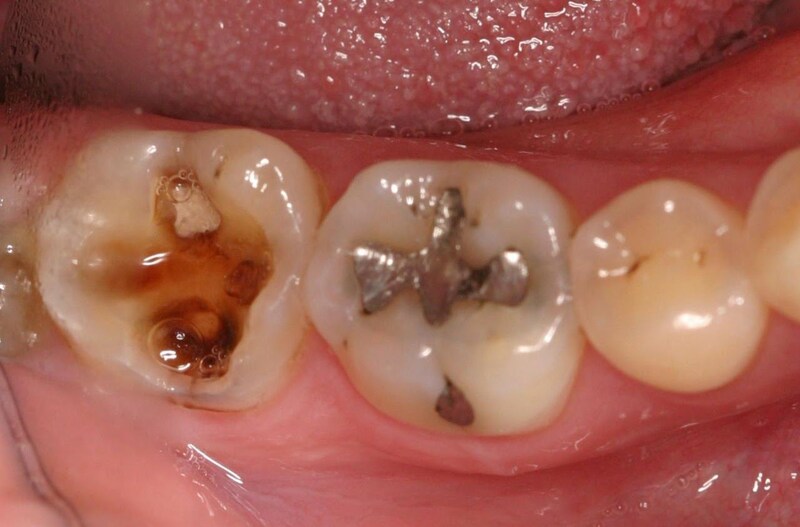 When tooth decay has been left untreated for an extended period of time, it will often become visible to the eye. Often minor tooth decay will appear as a chalky white discoloration of the tooth; this is due to the decaying of calcium from your enamel. If this symptom is not treated and allowed to continue decaying, it can eventually become a brownish-black spot or hole on the infected tooth. If you spot either of these signs be sure to visit the dentist as soon as possible. As already mentioned holes in your teeth might appear discolored and easy to spot, this is not always the case. You can sometimes see holes on the surface of your teeth or between them, with no significant discoloration at all. You may feel smaller less visible holes with your tongue if this is the case; you likely have a cavity and should visit the dentist as soon as you can. Rotten teeth are a jackpot for bacteria and with the slowly decaying dental pulp you’ll likely notice and experience bad breath. If you’re brushing your teeth and tongue regularly but still experience bad breath, it may be due to tooth decay and you should visit your dentist to have them cleaned and treated. Having sensitive teeth can be a sign of cavities and tooth decay as it usually indicates a hole in the tooth, if your tooth is sensitive to cold foods and sends sharp pains through your mouth, then you could consider this a positive as it means that despite the decay, your tooth is still alive. If this is treated on time; cleaned and filled you could save the tooth and save yourself having to get a root canal treatment. If your tooth is sensitive to anything hot, you may be too late, as this is usually a sign of a dying or dead tooth. Gums bleeding can be a potential sign of tooth decay, but could also be a sign of gingivitis, both of which you should get checked out. If you have a cavity, between two teeth there is the possibility that the gum tissue grows into the area, which when brushed or flossed can become injured and bleed. This is not always a sign of tooth decay and can instead be gingivitis, so if you notice regular bleeding from your gums, be sure to get it checked out with your dentist. It is always a good idea to go for regular checkups at the dentist and be able to identify potential dental problems yourself. This allows you to catch any diseases or complications early and have them treated before they turn into anything serious. Tooth decay is irreversible and while you can get dental implants, they’re expensive and un-needed when you could just take 4 minutes out of your day to look after your teeth! If you spot any of the symptoms or signs on this list, be sure to seek medical advice and have them treated immediately.